Robert Bloomfield, whom John Clare described as 'the most original poet of the age,' was a widely read and critically acclaimed poet throughout the first decade of the nineteenth century, and remained popular until the beginning of the twentieth century. Yet until now, no modern critic has undertaken a full-length study of his poetry and its contexts. Simon J. White considers the relationship between Bloomfield's poetry and that of other Romantic poets. For example, her argues that Wordsworth's poetics of rural life was in some respects a response to Bloomfield's The Farmer's Boy. White considers Bloomfield's emphasis on the importance of local tradition and community in the lives of labouring people. In challenging the idea that the formal and rhetorical innovation of Wordsworth and Coleridge was principally responsible for the emergence of a new kind of poetry at the turn of the eighteenth century, he also shows that it is impossible to understand how the lyric and the literary ballad evolved during the Romantic period without considering Bloomfield's poetry. 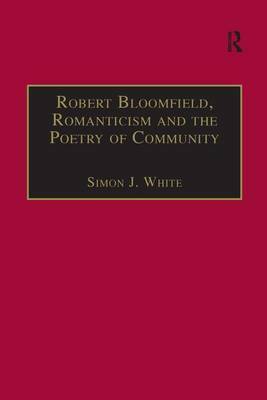 White's authoritative study demonstrates that, on the contrary, Bloomfield's poetry was pivotal in the development of Romanticism.